If the source of the ionizing radiation is a radioactive material or a nuclear process such as fission or fusion, there is particle radiation to consider. Particle radiation is subatomic particle accelerated to relativistic speeds by nuclear reactions. Because of their momenta they are quite capable of knocking out electrons and ionizing materials, but since most have an electrical charge, they don't have the penetrating power of ionizing radiation. The exception is neutron particles; see below. There are several different kinds of these particles, but the majority are alpha particles, beta particles, neutrons, and protons. Roughly speaking, photons and particles with energies above about 10 electron volts (eV) are ionizing (some authorities use 33 eV, the ionization energy for water). Particle radiation from radioactive material or cosmic rays almost invariably carries enough energy to be ionizing. Most ionizing radiation originates from radioactive materials and space (cosmic rays), and as such is naturally present in the environment, since most rocks and soil have small concentrations of radioactive materials. Since this radiation is invisible and not directly detectable by human senses, instruments such as Geiger counters are usually required to detect its presence. In some cases, it may lead to secondary emission of visible light upon its interaction with matter, as in the case of Cherenkov radiation and radio-luminescence. Ionizing radiation has many practical uses in medicine, research and construction, but presents a health hazard if used improperly. Exposure to radiation causes damage to living tissue; high doses result in Acute radiation syndrome (ARS), with skin burns, hair loss, internal organ failure and death, while any dose may result in an increased chance of cancer and genetic damage; a particular form of cancer, thyroid cancer, often occurs when nuclear weapons and reactors are the radiation source because of the biological proclivities of the radioactive iodine fission product, iodine-131. However, calculating the exact risk and chance of cancer forming in cells caused by ionizing radiation is still not well understood and currently estimates are loosely determined by population based data from the atomic bombings of Hiroshima and Nagasaki and from follow-up of reactor accidents, such as the Chernobyl disaster. The International Commission on Radiological Protection states that "The Commission is aware of uncertainties and lack of precision of the models and parameter values", "Collective effective dose is not intended as a tool for epidemiological risk assessment, and it is inappropriate to use it in risk projections" and "in particular, the calculation of the number of cancer deaths based on collective effective doses from trivial individual doses should be avoided." ^ Weisstein, Eric W. "Radiation". Eric Weisstein's World of Physics. Wolfram Research. Retrieved 11 January 2014. ^ "Radiation". The free dictionary by Farlex. Farlex, Inc. Retrieved 11 January 2014. 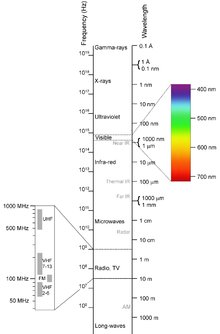 ^ "The Electromagnetic Spectrum". Centers for Disease Control and Prevention. 7 December 2015. Retrieved 29 August 2018. ^ a b c d e f g h Kwan-Hoong Ng (20–22 October 2003). "Non-Ionizing Radiations – Sources, Biological Effects, Emissions and Exposures" (PDF). Proceedings of the International Conference on Non-Ionizing Radiation at UNITEN ICNIR2003 Electromagnetic Fields and Our Health. ^ "ICRP Publication 103 The 2007 Recommendations of the International Commission on Protection" (PDF). ICRP. Retrieved 12 December 2013. ^ Moulder, John E. "Static Electric and Magnetic Fields and Human Health". Archived from the original on 14 July 2007. ^ Dunn, Peter (2014). "Making Nuclear Music". Slice of MIT. Retrieved 29 August 2018.